Snippets of Jack: The Black Spot. 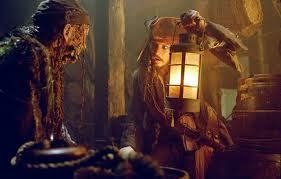 After aquiring a crew Jack Sparrow encounters a problem; his "magic" compass can't tell what he wants. So he and crew set sail with no heading. While at sea Jack is visited by Bootstrap Bill Turner(Will's Father) . And he has a message for Jack from Davy Jones. "You have a debt to pay. You owe Davy Jones your soul. That was the agreement. Time's up. You're a marked man, Jack Sparrow. ""Any idea when Jones might release said terrible beastie? ""I already told you, Jack. Your time is up. It comes now, drawn with ravenous hunger to the man what bears...the Black Spot." Apperantly after this Jack starts acting a litle weird, ordering his crew to keep the boat in the shallows and such. "Have you noticed lately, the captain seems to be acting a bit strange…er?" "Setting sail without knowing his own heading. Something's got Jack vexed, and mark my words, what bodes ill for Jack Sparrow bodes ill for us all." Now that Jack knows he has a large ravenous beast coming after him he has to come up with a plan, and fast! Of course he can't sacrifice his own life to save his crew from the kraken so he sells Will to Davy Jones to settle his dept. However, Davy doesnt accept that. "You have a debt to pay. You owe Davy Jones your soul. That was the agreement. Time's up. 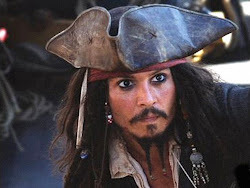 You're a marked man, Jack Sparrow." And so the beast is sent out again. And this time he wont be stopped. Jack and his crew fought valiantly against the beast managing to scare it off for a time, but when he returned they were forced to make a decision. They chose to abandon their ship The Black Pearl. But No everyone agreed. And she forced her opinion on Jack in the form of a kiss. After said kiss she handcuffed him to the mast of the ship and left him for dead to save herself and the crew, mainly Will though. But wait Jack manages to escape the handcuffs but not in time to flee from the beast. however he does get his sword out and kills the beast while being "eaten". Of course he isnt really dead. Just half dead iving with 20 of himselves on his ship in the middle of the desert. He tried valiantly to escape but he cant do it alone. Any good captain needs a crew. And this captain's crew comes to his rescue.....eventually.